The credits have rolled on the final act of Christopher Nolan's Batman trilogy, and at least one thing seems clear: Nolan doesn't really get Batman. Not to say Nolan's Batman films are bad. "Batman Begins" is a good movie, while "The Dark Knight" borders on being a great one — and it is without doubt a great Joker film, mostly thanks to Heath Ledger. But neither is a particularly good Batman film. 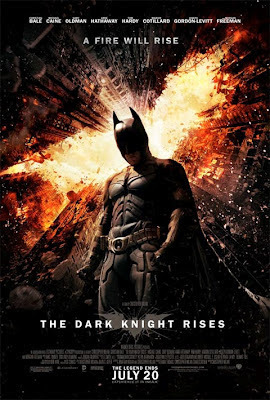 That brings us to the grand finale, "The Dark Knight Rises," which is uneven, with slightly more faults than virtues, and a mess as a Batman movie, despite cribbing most of its plot straight from three Batman comic books: "Knightfall," "No Man's Land" and "The Dark Knight Returns." Two of those, "Knightfall" and "No Man's Land," weren't especially good to begin with, and none of them really goes with the others. Throw in superfluous references to Charles Dickens' "A Tale of Two Cities" — to "elevate the material," as they say, above a "mere" superhero story — and you have an overly ambitious closing chapter that takes forever to get going and, when it does, glosses over characters and events that could use more development. But the problems here are more fundamental than poor pacing and plot holes. The problems start with Batman. Nolan sees him as a reluctant hero, looking to escape having to be Batman. We see signs of that in "The Dark Knight," with Batman/Bruce Wayne (Christian Bale) looking to Harvey Dent to take over the war on Gotham's underworld. That fails, but Batman takes the blame for Dent's crimes in order to preserve his legacy. "The Dark Knight Rises" opens eight years later. Organized crime in Gotham has been defeated by a tough-on-crime law called the Dent Act — talk about having to suspend your disbelief when it comes to superhero movies! — and Batman is in seclusion. But not only is Batman retired, so is Wayne. He has even lost track of the charities his foundation supports. And why? Mostly because he has spent eight years mourning the death of Maggie Gyllenhaal. (Or was it Katie Holmes?) It's as if Superman left Earth unprotected for five years and then finally returned only to become a deadbeat dad. Wait, I've seen that movie. It was terrible. Nolan's Batman doesn't have the obsessive drive it would actually take to become Batman. You don't become Batman unless you're sure that's who you are in the first place. It isn't like getting bitten by a radioactive spider. So, by attempting to humanize Batman and make him more "realistic," Nolan has come up with an emotionally conflicted Batman who is less believable. That is not "elevating the material." Nolan makes things worse by using Bane, one of Batman's least-inspired adversaries, as the main heavy. Poor Tom Hardy, try as he might, can't make Bane seem to be anything more than an absurdly pretentious masked wrestler. But at least Bane's most over-the-top line, "Your punishment must be more severe," will probably become an Internet meme. Also wasted is Michael Caine as Bruce's loyal butler, Alfred. He gives the movie's best performance, but he gets far too little screen time. The one saving grace of "The Dark Knight Rises" is Anne Hathaway, who dominates her every scene. She seems like the only actor having fun, and her Selina Kyle is the only character who has a believable, consistent agenda. It's no wonder there is talk about giving Selina — who is never actually called Catwoman — her own movie. Unlike the French Revolution it re-enacts in the streets of Gotham, "The Dark Knight Rises" is neither the best nor worst of times. It's just a middling conclusion to a trilogy and a character that needed and deserved better. There is a subset of romantic comedies in which one of the two lead characters approaches the other under false pretenses. Usually, the character is an undercover police detective or a journalist — a person pretending to be someone they're not. This set-up leads to an inevitable confrontation. The betrayed character learns he or she has been lied to, and the cop/reporter/etc. character apologetically confesses all, maintaining that while everything else was false, their love is real. And it is, too. You know this moment is coming, and if you're like me, you can spend an entire movie dreading it like a dog would dread a trip to the vet if dogs could read calendars. It's a ticking time bomb of movie clichés. 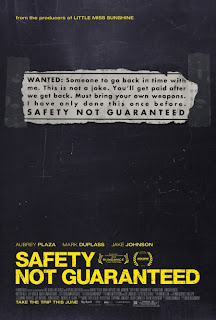 So, you must understand that it's high praise, coming from me, to say one of the best things about "Safety Not Guaranteed" is that when it gets to the scene where the reporter's cover is blown — that's not a spoiler; you know it's coming — the film handles it quickly, succinctly and moves on without too much fuss. For those of you whose concerns aren't eccentric, know that "Safety Not Guaranteed," directed by Colin Trevorrow and written by Derek Connolly, is an utterly charming romantic comedy that will especially appeal to people who don't like typical romantic comedies. The reporter — actually an intern — is Darius, played with her usual deadpan appeal by the geek goddess that is Aubrey Plaza ("Parks and Recreation"). When her boss at a hip, regional magazine decides to check out the story behind a bizarre classified ad, Darius is eager to tag along, as it's the first not-boring thing to come along. The ad reads, in part: "WANTED: Someone to go back in time with me. This is not a joke. 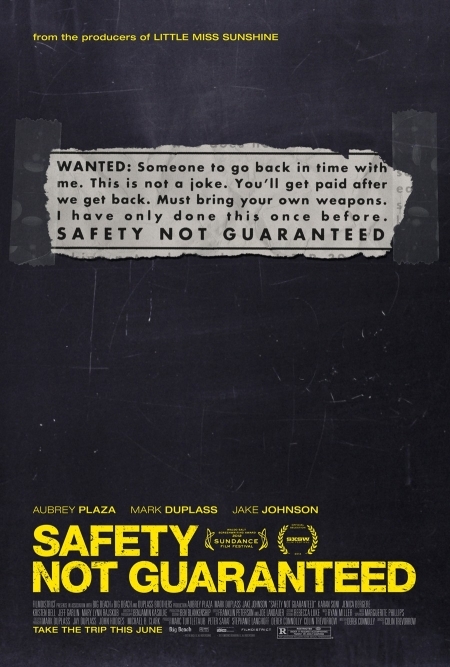 ... SAFETY NOT GUARANTEED." That's enough to intrigue Darius, who has been isolated, aloof and generally alienated from her peers and their interests since her mother died years before. So, Darius, nerdy fellow intern Arnau (Karan Soni) and smooth-talking reporter Jeff (Jake M. Johnson) take a road trip to find the person — probably a loon — who placed the ad. Well, sort of. Jeff really just wants to use the trip as an excuse to hook up with an old girlfriend (Jenica Bergere) while making the interns do all the real work. As a journalist, I can tell you this is totally realistic. That leaves Darius to approach the would-be time traveler and find out his story. Kenneth (Mark Duplass) claims to have traveled back in time once before, and he is absolutely serious about his mission, which involves weapons training and an emergency plan to get a message to his future self if anything goes wrong in the past. Like Darius, he's alienated from the world around him, he just has an unorthodox way of dealing with it. Duplass skillfully walks a fine line with Kenneth, making us root for him even as we wonder if he's entirely sane. And we also root for Jeff. In most romantic comedies, his character would be a one-dimensional jerk, but here he's a guy who is usually a jerk but also a real person. Again, as a journalist, I can confirm this is totally realistic. That said, "Safety Not Guaranteed" is Plaza's movie to carry, and the cynical, world-weary, wise-beyond-her-years presence she bring to bear here signals that we're probably looking at the rise of a new indie-film queen. That's not guaranteed, mind you. But then nothing worthwhile ever is. Clever children having to deal with not-so-clever adults is a movie trope that's far older than either Macaulay Culkin or the Goonies, and with good reason. It's the ultimate empowerment fantasy played out against the first authority figures any of us encounter: grownups. Director Wes Anderson's cinematic children are probably better equipped to take on The Man than most. They're ridiculously smart and preternaturally wise for their age, although not as wise as they think they are. But who is? The Tenenbaum siblings of Anderson's 2001 film "The Royal Tenenbaums" are all child prodigies. Unfortunately, they grow up to be sad, dissatisfied and just plain messed-up adults, pretty much like most of Anderson's other adults. If only we could all be like Peter Pan and fly away to Never Never Land and never grow up. Perhaps that's just what Sam and Suzy, engagingly played by newcomers Jared Gilman and Kara Hayward, have in mind when they run away from home in Anderson's latest movie, "Moonrise Kingdom." 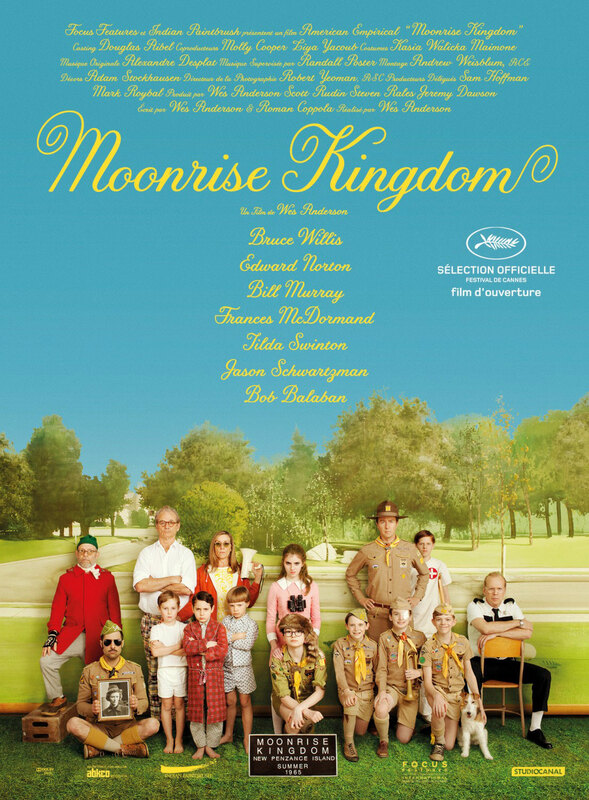 Set in a small New England island community in the mid-1960s, "Moonrise Kingdom" manages to be simultaneously nostalgic for a more innocent time that never was, yet clinically unsentimental about the whole nostalgia business. It's the cool, detached approach that has become Anderson's calling card, and which he perfects here, with the aid of co-screenwriter Roman Coppola, director of the criminally overlooked film "CQ." Amazingly, the result is also — dare I say? — heartwarming. Both Sam and Suzy are classified as "problem children." They read too much and have ideas of their own. So when first love hits them, they run off, camping gear and borrowed record player in hand, on an adventure. Not exactly hot on their trail are Sam's well-meaning but clueless scout master (an unusually likable Edward Norton), sad sack policeman Capt. Sharp (Bruce Willis) and Suzy's unhappily married parents, Walt and Laura (Bill Murray and Frances McDormand). With their bad marriages and bad careers and lost loves, the adults are a pretty miserable bunch. It's telling that the only grownup character who has his act together throughout is Bob Balaban's omniscient narrator, who hints to us at the very beginning that he's read ahead in the script. The screenplay is full of great lines, and Norton and Murray are both in scene-stealing form, but none of that would matter if Gilman and Hayward weren't up to the challenge. They carry the film and make it seem easy, which is likely a testament to Anderson's direction. This is filmmaking with authority, which is ironic given that authority appears to be Anderson and Coppola's main target for ridicule. No authority figure is left unscathed, whether it's Capt. Sharp and his deflated ego or the pompous woman from Social Services — identified simply as "Social Services" and played with bureaucratic bluster by Tilda Swinton. The only people who seem capable of carrying out a plan are our young protagonists and, later on, Sam's fellow scouts. Minor spoiler: It's no accident that Norton's Scout Master Ward only has his moment of triumph after being relieved of command. This is a more hopeful Wes Anderson than we've seen before. He leaves us charmed and cautiously optimistic. Maybe, unlike those Tenenbaum kids, Sam and Suzy will grow up to be OK.